Traditional 10k White Gold Celtic cross available in three different sizes. Handmade in Ireland and hallmarked at the Irish Assay Office in Dublin Castle. This beautiful 10k White Gold Celtic cross has an intricate knot pattern and is completed with classic sun circle. The necklace is available in three sizes and comes fitted with an 18 white gold chain. This Celtic cross pendant is cast in the finest hallmarked 10k white gold and is hallmarked at the Irish Assay Office in Dublin Castle. Guaranteed Irish jewelry shipped for free from Ireland. 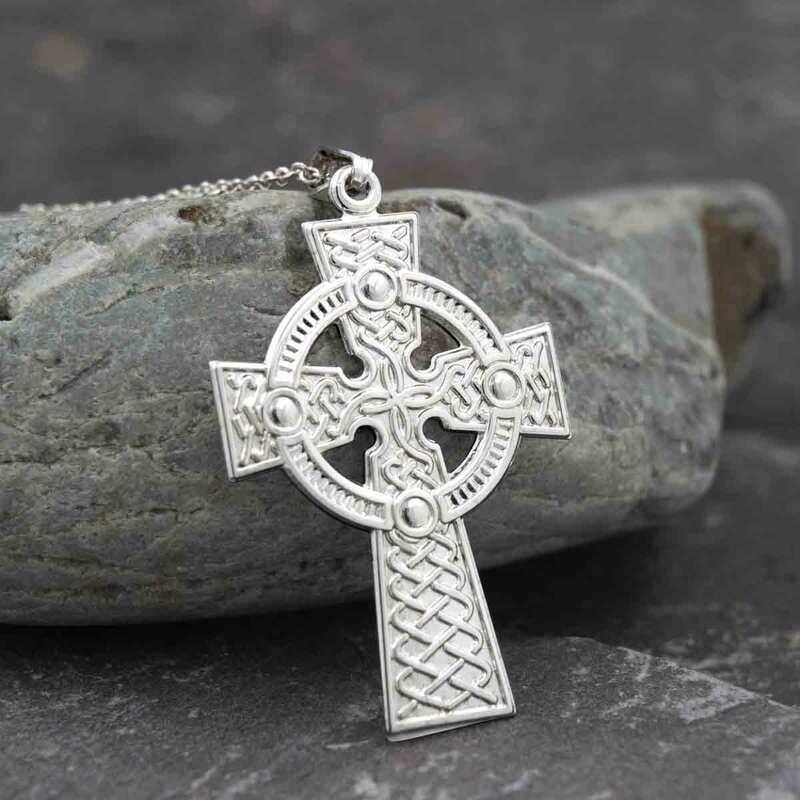 A much loved jewelry piece for both men and women, the Celtic Cross is worn as a symbol of faith or as a fashion piece and remains a classic favorite for all ages. Celtic Crosses dot our landscape, the earliest of which were inscribed onto rock or created in wood. Legend has it that the Celtic Cross, with its unique circle, was created by St. Patrick who combined the pagan circle symbolizing the sun with the traditional cross in order to convert pagans to Christianity.